Apple has announced its new range of MacBooks and its first LED backlit Cinema Display at a press conference at its Cupertino headquarters. The company presented new 13.3" MacBook and 15.4" MacBook Pro designs – the chassis are, like the rumours suggested, built from a solid block of aluminium. There were two new MacBook Pro models announced, both featuring a 15.4" LED-backlit display with a glossy covering that will undoubtedly split opinion down the middle. What's more there's no matte option available with any of the new MacBooks – it's clearly going to be a love-it-or-hate-it affair. The priciest model comes in at £1,749 (inc. VAT) and features a 2.53GHz Core 2 Duo (6MB L2 cache), 4GB of DDR3 1,066MHz memory, a 320GB hard drive, a GeForce 9400M integrated graphics chipset and a GeForce 9600M GT 512MB discrete graphics card. The cheaper MacBook Pro comes in at £1,399 (inc. VAT) and features a 2.4GHz Core 2 Duo (3MB L2 cache), 2GB of DDR3 1,066MHz memory, a 250GB hard drive, a GeForce 9400M IGP and a GeForce 9600M GT 256MB discrete graphics card. Both weigh 2.5kg, feature a pair of USB 2.0 ports, a Firewire 800 port, a mini-DisplayPort socket, Gigabit Ethernet, integrated 802.11n WiFi, a built-in iSight camera and everything else you'd come to expect. There's one thing you won't be familiar with though, and that's the button-less multi-touch glass trackpad – there are no buttons and you tap the trackpad instead of clicking a trackpad button. These are undoubtedly expensive notebooks though and definitely not for everyone – for those with thinner wallets, Apple has updated the MacBook range with a design that's very similar to the new 15.4" MacBook Pros. 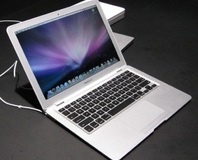 The cheapest of the two MacBooks comes in at £949 (inc. VAT), which raises the entry-level bar for Apple's notebooks. The company has, however, kept the old White MacBook in its range at a reduced price of £719 in order to fill the void at the bottom of Apple's range. The new entry level MacBook still uses a 13.3" LED-backlit display (complete with the same glass cover as the new MacBook Pros) and comes with a 2.0GHz Core 2 Duo, 2GB of DDR3 1,066MHz memory, a 160GB hard drive and a GeForce 9400M integrated graphics chipset. The more expensive MacBook comes with a 2.4GHz Core 2 Duo and a 250GB hard drive – the rest of the specs remain the same. The price increase for these upgrades is a cool £200 once you factor in the tax man's cut. Like the new MacBook Pros, the MacBooks feature a pair of USB 2.0 ports, a mini DisplayPort socket along with Gigabit Ethernet and 802.11n wireless networking and a built-in iSight camera - bizarrely there's no Firewire port, though. The new models weigh almost a quarter of a kilo less than the older MacBook at just over 2kg and they're also thinner as well at 24mm. There was also an updated MacBook Air announced, but nearly all of the flaws with the initial design remain. 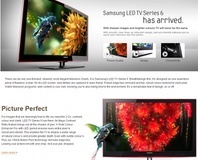 The only notable changes are the upgrade to Nvidia GeForce 9400M integrated graphics and the decision to swap out the mini-DVI connector for mini-Displayport. There are also bigger hard drives (using SATA instead of IDE this time) and Apple has moved the Air to DDR3 like the newer MacBooks, but that's about all that has changed. Interestingly, despite Steve Jobs essentially announcing the death of Ethernet when he unveiled the MacBook Air, both the MacBook and MacBook Pro sport Gigabit Ethernet sockets. The other annoyance for me is the inclusion of a mini DisplayPort connector – there's simply no reason for it whatsoever, other than to coax people into buying either an adapter (mini DisplayPort to dual-link DVI costs in the region of £70, for what it's worth) or buying one of Apple's new 24" LED Cinema Displays. Speaking of which, this was the surprise announcement during the keynote – but it was long-overdue. 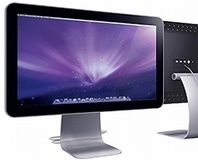 This has a characteristically sleek design, features LED backlighting, a glass (glossy) cover a 1,920 x 1,200 native resolution, built in stereo speakers, a USB 2.0 port, a mini DisplayPort connector and a MagSafe power connector for charging your MacBook. This won't come cheap at almost £650 (inc. VAT) but it does look pretty nice – the question is whether it actually performs as well as it looks. On the whole, I'm a little disappointed with the announcements in some respects – my biggest disappointment is the increased barrier for entry. The other major disappointment for me is the inclusion of the mini DisplayPort connector – there's plenty of room for a full-sized DisplayPort socket, but that'd mean Apple can't fleece even more money out of those wanting to use a non-Apple display. Sure, it won't fit on the MacBook Air, but frankly anyone buying a notebook with such a flawed set of connectivity options afforded by the form over function design should be fleeced for as much as possible in my opinion. With that said, there are some good trends – I like the fact Apple has included a decent GPU (even if it's integrated) in all of its notebooks, as it could signal Apple's intention to really harness the power of the GPU with its drive behind OpenCL. The designs look stunning as well, but I'm still concerned with their robustness when it comes to accidental spillages – I doubt the keyboard is splash proof, for example. That's enough to prevent me from buying one, that's for sure, but I'm confident that many will love the new MacBooks – but there'll be an equal number who won't because there is no option for a matte display. Share your thoughts on the announcements with us in the forums.